The total weight of all the asteroids in the asteroid belt is about 1/35th of that of our moon! The largest asteroid, called Ceres, makes about 1/3 of the total weight of all the asteroids! How big are the asteroids? There are probably several million asteroids in the solar system. Over 96,000 asteroids have been given numbers. Almost 12,000 of them have names. But even though there are a lot of asteroids, the asteroid belt is mostly empty space. Traveling through the asteroid belt in a space ship would not be very much like what you see in a science fiction film. What are they named after? The first asteroids were named after mythical heroes and gods much like the major planets. The first to be discovered was named Ceres after the Roman goddess of growing plants (particularly grain) and of motherly love. The second asteroid discovered was called Pallas named after one of the Greek gods of wisdom. Asteroids are also given a number in the order of their discovery, so Ceres is 1, Pallas is 2, and so forth. As the number of known asteroids increased, the supply of mythical names was exhausted so names from other sources were used. Some asteroids were named after countries. For example asteroid number 136 is named Austria. Others were named after plants, for example 978 Petunia. 1620 Geographos was named after the National Geographic Society, in recognition to their efforts at sharing knowledge about the Solar System. Many are named after people both alive and dead. In a couple of cases, like 2309 Mr. Spock, asteroids were named after the discover's pet cat. This naming has been discouraged, but it still happens occasionally. Even fictional characters have been used. Today, names for asteroids can be suggested by the people who discover them. The names become official after a group of people reviews them to make sure they are not offensive or too much like another name. Due to some automated asteroid scanning observatories and a systematic exploration of the Solar System for near Earth asteroids, most new asteroid discoveries are not even getting a name at all, but rather a numerical designation, and it is not anticipated that they will ever be given a formal name, at least in this century. The first asteroid to be discovered was Ceres, on 1 January 1801, by Giuseppe Piazzi on accident. At first he thought this was a comet, then later a planet! When it was realised it was too small Sir William Herschel (the astromoner who discovered Uranus) made up the word "asteroid" to describe it, from the Latin word aster meaning star and the -oid meaning rock or planet. In other words a star-like planet because he couldn't see any details due to the small size of the object. 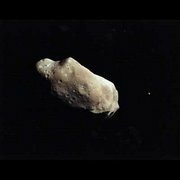 By 1807 another 3 asteroids were discovered, but no more were found until 1830 when a persistent asteroid hunter named Karl Ludwig Hencke found a fifth and sixth asteroids. Ever since then at least one new asteroid has been found each year. In 1891 the first pictures of the night sky were taken to find more asteroids. This led to the discovery of many more asteroids. A picture of the same part of the sky is taken on two different nights. When the two pictures are compared, any asteroids will have changed their location on the image compared to the stars. In our modern times, over 280,000 asteroids have been discovered. Many more are being found all the time. Some of these asteroids pass near the earth and astronomers want to find any that come close to our planet. Most asteroids (3 out of 4) are made of carbon-based rock. The rest are made of the metals iron and nickel. About half of these are pure iron and nickel; the rest are mixed with silica compounds. Each of the larger metal asteroids contains more iron than has been mined in the entire history of human kind. Are there asteroids outside of the asteroid belt? Most asteroids are found in the asteroid belt, but not all. Some asteroids orbit closer to the Sun. Asteroids that closely approach Earth are called Near-Earth Asteroids. Sometimes they strike the Earth, burning in the atmosphere as a meteor. If they are large enough, they might actually hit the surface and become meteorites. There are also some asteroids in the outer solar system that are called Centaurs, although it is hard to determine whether a particular Centaur is an asteroid, comet, or Kuiper Belt object. For example, the first Centaur to be discovered was Chiron. But some scientists think it is a comet, not an asteroid. Officially it is both the asteroid 2060 Chiron and the comet 95P/Chiron! Some asteroids are also found at the stable points 60Â° behind and ahead of the orbits of Jupiter and other planets. The points are called Lagrange points and the asteroids found there are called Trojans. Many of the small moons of some planets may have once been asteroids that were captured by the planet's gravity when they came too close.